The Nth Doctor is a man defined by his appetites. In contrast to many of his predecessors, this epicurean Time Lord always finds the time to enjoy a meal or a fine cigar. When the TARDIS lands on an alien starship or amid some historic crisis, it’s typical for the Doctor to gain his bearings by first seeking out a drink. In his adventures thus far he’s enjoyed a spot of Elystrian burned wine, a Drashani Syrah, brandy, prosecco, gin, and classic cocktails ranging from the colony to the sidecar. It seems fitting that we find the time to post the occasional drink recipe for the sort of pick-me-ups well-suited to the Doctor Who game table. That said, the latest cocktail is mixed in tribute not to the Doctor but to one of his great television companions. The Ginger Scotch—better known to Whovians as an Amy Pond—is as bright and invigorating a drink as its ruby complexion would suggest. Any tipple mixed in tribute to the one and only Amelia Pond would have to be both sharp and sweet, of course. The Ginger Scotch delivers. In make-up, it’s not unlike a Mamie Taylor or Glasgow Mule. 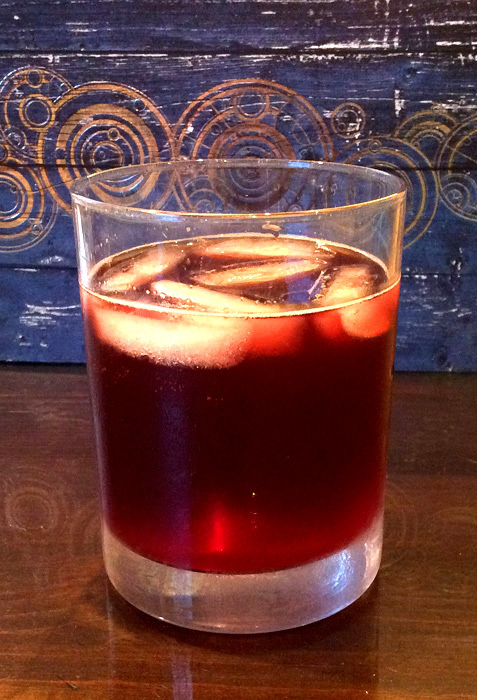 Combining ginger beer, black cherry juice, grenadine, bitters, and, of course, Scotch, this blend teeters between savory and sweet, imparting the same fierce flavor as Karen Gillan’s performance. (Our Ponds were mixed with Gosling’s Ginger Beer, which brought just the right bite.) If your character sheet calls for a companion that is both adventurous and reckless, stubborn and also fun-loving, sharp but also sweet, then you might consider mixing up a batch for your next game day. For a full recipe, be sure to take down the details provided for an Amy Pond at Nicole Beckerman’s Doctor Who Cocktails blog. Food is a staple of the game table. One works up quite an appetite hurling the 2d6! It’s just one of the reasons that we decided to start sharing our favorite Doctor Who recipes here on the blog. Every player has their own traits, attributes, and tastes, however, and agreeing on the ideal snack isn’t always easy. Thus far we’ve featured recipes for notable apertifs and hors d’oeuvres. If the Jelly Babies that garnished our most recent cocktail appealed to your sweet tooth, then you’re more apt to go straight for afters. Once the pizza and the crisps have been cleared away, it’s time for dessert! Undoubtedly the most delicious tidbit featured during our recent Doctor Who marathon was this beautiful recreation of a concoction that should be instantly recognizable to any fan worth his or her credentials. 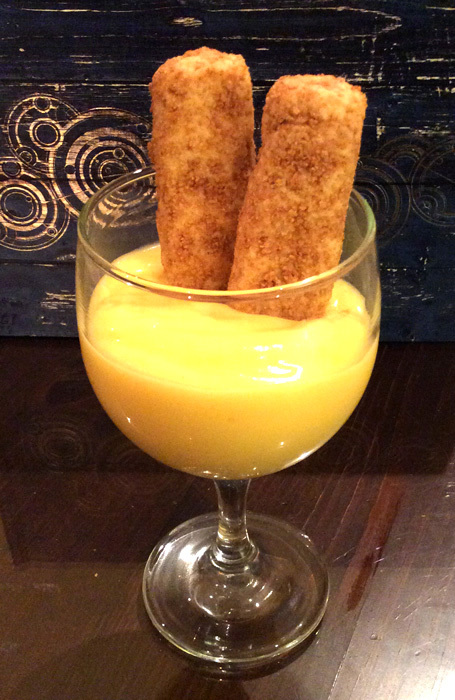 Fish fingers and custard. Is there a more iconic dish in the whole of the canon? Given the gusto with which the Eleventh Doctor gobbled up his post-regenerative repast in “The Eleventh Hour,” who among us has not been tempted to have a taste? Not all of us share his rather unique cravings, however. For those with more pedestrian palates, this deceptive recipe swaps fish fingers for a vanilla cookie baked from confectionery sugar, salt, baking powder, flour, vanilla extract, almond extract, egg, and butter. The vanilla biscuits are then breaded in graham cracker crumbs as a clever camouflage. The resulting dessert is lovely to look at, fun to eat, and positively delicious. For detailed instructions that will allow you to whip up a batch of sweet fish fingers and custard in time for your next game day, visit Darla’s Bakingdom blog. Our recent “Day of the Doctor” marathon, designed to recreate the revelry of those celebrations surrounding Doctor Who‘s fiftieth anniversary, brought with it a bevy of themed food and drink as each television adventure was accompanied by its own hand-picked pick-me-up. 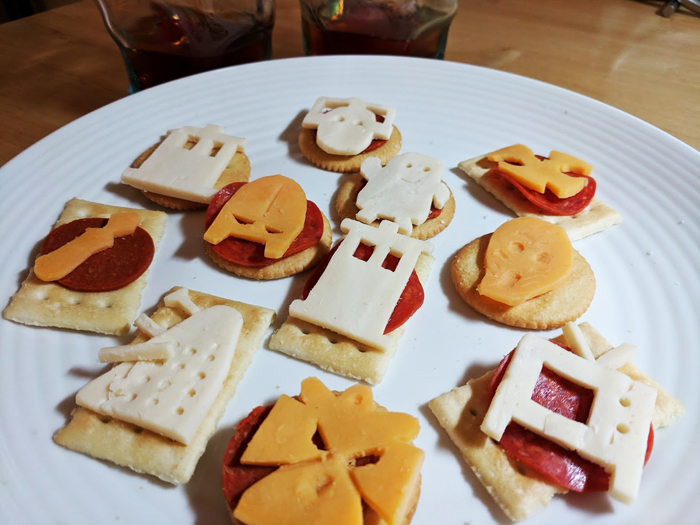 We’ve been sharing a few of those recipes in the hopes that they might be reimagined as titillating refreshment for Doctor Who role-playing sessions. By the time that Matt Smith and David Tennant took to the screen in the latter half of the day, it seemed fitting that we found ourselves reaching for something a bit more saccharine. Fortunately, our drinks planner had a tipple for each of the Doctor’s many moods. The Red Jelly Baby is a cocktail designed to capture all of the sweetness and familiar comfort of its namesake. Combining cherry vodka, triple sec, grenadine, peach schnapps, and a healthy dose of Sprite, it resembles various drink recipes inspired by Gummy Bears or similar sugar candies. What is most remarkable about the Red Jelly Baby is just how well it captures the strawberry flavor of biting into one of Bassett’s Brilliants. The drink is lush, fruity, and, above all, sweet. With a sip, you can hear the rich, playful tones of Tom Baker’s voice in your ear. Here is a drink that would serve to perfectly complement a role-playing session based on the Fourth Doctor Sourcebook. The Curator of the Undergallery would, no doubt, approve. For complete and surprisingly specific instructions, be sure to study Alex Murphy and Nicole Beckerman’s recipe for the Red Jelly Baby—which details not only the constituent ingredients but also the precise order in which you should arrange your Jelly Baby garnish to best emulate that celebrated scarf! In the opening scene of “The Day of the Doctor” (2013), our favorite renegade Time Lord regales Clara Oswald with a list of the exotic places they’ll soon be visiting in the TARDIS. Ancient Mesopotamia! Future Mars! The Impossible Girl hesitates, insisting that she’ll come along for the ride only if there will be cocktails. The Doctor assures her that cocktails will be served—on the moon. Who could refuse? This playful exchange provided an apt mission statement for our team’s recent Doctor Who marathon. In addition to a televisual showcase of some of the Doctor’s most memorable stories, the festivities featured a tempting array of themed food and drink. This, of course, meant that there were enough cocktails on hand to satisfy even the thirstiest of companions. After sharing the recipe for Slitheen egg hors d’oeuvres, it’s time to turn our attention to the bar cart! Concocting mixed drinks inspired by the Doctor’s illustrious travels is fast becoming a popular pastime, and no party would be complete without a cocktail inspired by his faithful, faulty Type 40 time capsule. For Doctor Who fans, hope is blue—and often accompanied by obligatory outbursts of wheezing and groaning! But what does unrestricted access to all of time and space taste like? 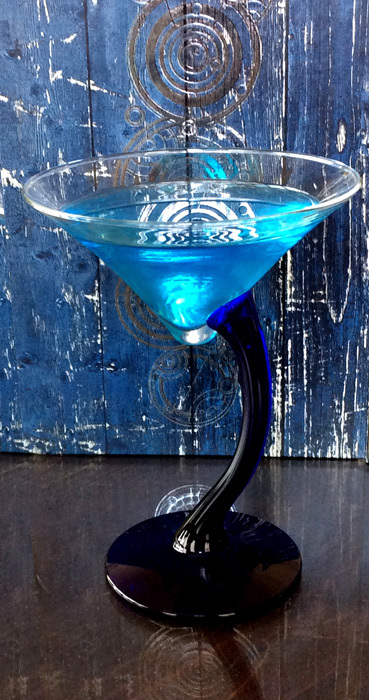 While there are a variety of recipes available for so-called Tardis-tinis, particularly those involving Hpnotiq, our cocktail planner chose to keep things simple by mixing up a batch of Blue Cosmopolitans. Consider it a martini with a malfunctioning chameleon circuit. The Cosmopolitan is the youngest of the classic cocktails, a fresh and fashionable apertif. Locating the ingredients for a Blue Cosmo is easy, and the glow of the finished drink in its cocktail glass immediately evokes the soothing hues of a police box. Made with vodka citron, blue Curaçao, white cranberry juice, and lime juice, this cocktail is sweet but also remarkably refreshing. It offered elegant embellishment to our afternoon screening of An Adventure in Space and Time (2013) and would be a welcome sight at any game table set-up for a Doctor Who: Adventures in Time and Space role-playing module. To recreate our version of a simple Tardis-tini, consult Absolut’s recipe for the Blue Cosmopolitan. If you’re looking for something with a dash more splash, be sure to check out Alex Murphy and Nicole Beckerman’s instructions for mixing a Hpnotiq Tardis-tini. Recently, our Doctor Who: Adventures in Time and Space team sat down for a “Day of the Doctor” marathon designed to recreate the fun and excitement of Doctor Who‘s fiftieth anniversary. The party was planned for one member of our team in particular, who wasn’t yet a Whovian at the time of the anniversary in November of 2013. The viewing schedule included screenings of “An Unearthly Child” (1963), An Adventure in Space and Time (2013), and “The Day of the Doctor” (2013). In addition to allowing us the opportunity to relive some of the great moments in the history of the series, the celebration gave us an excuse to indulge in a variety of themed refreshments, from snacks to cocktails. A marathon this momentous called for more than just jelly babies! We had so much fun with the food and drink for this event, we’re going to be posting some photos and recipes here on the blog. Any one of them would offer a suitably elegant (or is that eccentric?) 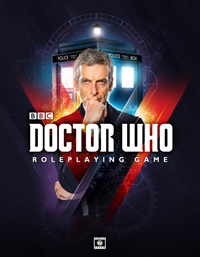 complement to your next Doctor Who gaming session. Perhaps the most visually striking dish of the day was this platter of Slitheen eggs. What at first appears to be some slimy specimen from Raxacoricofallapatorius—a hard-boiled Blon Fel-Fotch, perhaps—is, in fact, a delicious hors d’oeuvre. 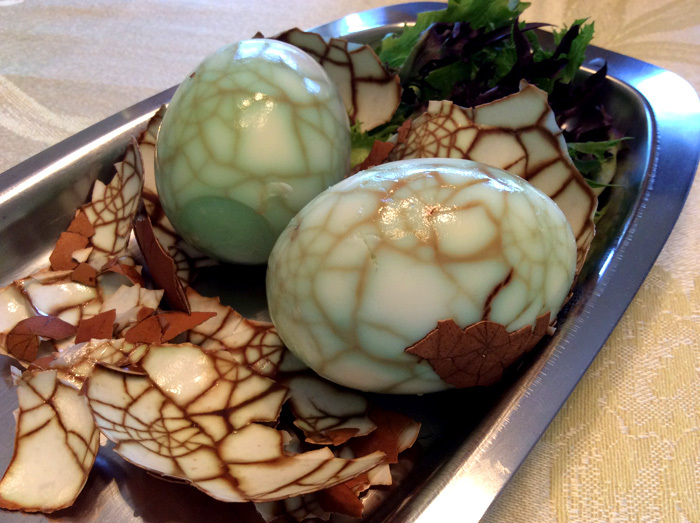 These marbled beauties introduced us to the joys of the Chinese tea egg. Cracked eggs are steeped in a savory concoction of tea and spices including peppercorns, cloves, anise, and ginger. They’re as fun to prepare as they are to eat, and the end result is beautiful to behold. The addition of food coloring allows you to prepare the eggs in any color that you like. For those seeking more flavor, the dish can be accompanied by a soy and balsamic mayonnaise. If you’re looking for a game table snack that delivers a certain shock value, look no further than the Slitheen. Visit Kitchen Overlord for the complete recipe, or pick up a copy of Chris-Rachael Oseland’s Dining with the Doctor: The Unauthorized Whovian Cookbook.